It Takes a Riot immerses the viewer in the tension that led to the events of May 4, 1992. 25 years later, this is the first documentary about that moment. I'm too young to remember the Rodney King riots of the early '90s. However, I've seen the images countless times — four acquitted police officers smiling in relief, grainy video footage of their beating of Rodney King. I've seen the pictures of buildings on fire, angry young people and police in military gear. Scenes like those define that landmark moment in U.S. history. Here in Toronto, there was also a rumbling of rage and frustration. 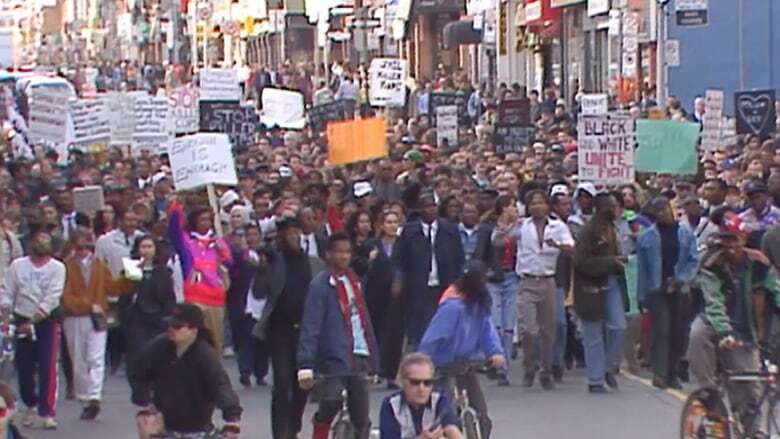 One day in 1992, it exploded on a downtown Toronto street filled with hundreds of demonstrators — but those images have received far less attention. Now, that demonstration is the subject of a documentary short by New York-based director Howard Grandison. Called It Takes a Riot: Race, Rebellion and Reform, I saw it at Ryerson University last week. The film captures one of those rare instances when the mask of Canadian benevolence is lifted. 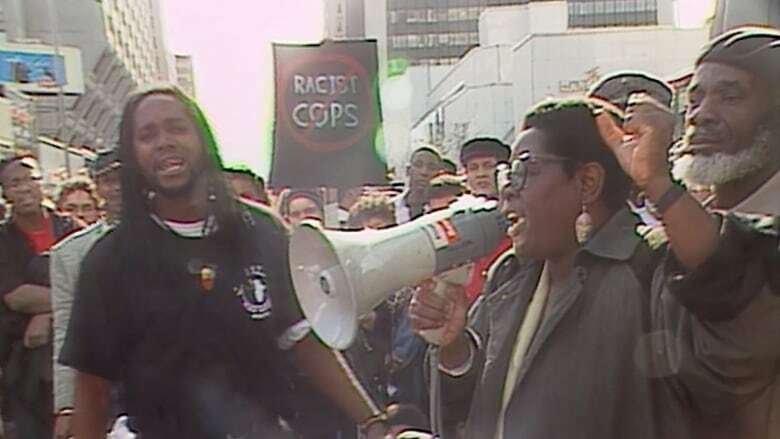 On May 4, 1992, the Black Action Defense Committee (BADC) organized a demonstration as a response to what was happening in L.A. and to protest police brutality in Toronto. Just two days earlier, a 22-year-old black man named Raymond Lawrence had been murdered by the Toronto Police. The demonstration was peaceful if tense, but in the hours that followed its conclusion, passions began to flare. The next day, news media carried images of destroyed storefronts and vandalized buildings. Headlines described a scene of "hooligans" who had caused a "mindless melee" that had nothing to do with race because our "record [was] tolerable compared to the U.S." Dubbed a "riot" by the media, the filmmakers have chosen a different word to describe it: an uprising. The title of the film refers to what this moment ignited. The May 4 demonstration sparked a firestorm of public dialogue around race. From those conversations came high-profile policy reports and funding for social programs such as Fresh Arts — initiatives that changed lives. The uprising also inspired poetry by Dionne Brand, theatre by Andrew Moodie and countless academic studies. But 25 years later, this is the first documentary about that moment. As we filed in to watch the film, a woman named Anne introduced herself and told me that she had attended the demonstration in '92. "I wonder if they'll talk about how the police blocked us into Nathan Phillips Square with their horses," she pondered aloud. "They never wrote about that in the papers but I remember that. There's a lot I remember that they didn't put in the papers." The film captures one of those rare instances when the mask of Canadian benevolence is lifted. There are scenes of police on horseback charging at demonstrators, young people — of all races — screaming back in rage. At one point, an elder chokes back tears recounting his fear. During the film I gasped and jumped in my seat. There were moments where my eyes widened in shock. I observed Anne a few seats away, nodding at different moments and dabbing her eyes with a tissue. Indeed, we weren't alone: the entire audience seemed to have a visceral reaction to the film's urgent pacing and piercing imagery. It Takes a Riot combines contemporary interviews with powerful archival footage, immersing the viewer in the tension that led to the explosion of frustration on May 4. The auditorium was filled to standing room only. Students were next to elders, artists whispered with activists — and it felt like one of those rare and magical moments when disparate perspectives find cohesive ground. During the panel conversation following the screening, BADC member Lennox Farrell addressed the crowd. "I see tonight as a transitional kind of night," Farrell said. "A kind of passing of the torch — from one generation to another." Brock University professor Simon Black is the co-writer and co-producer of the short doc. He also spoke during the panel. "When we decided to make this film, it was really as a love letter to the Black Action Defense Committee and Black Lives Matter (BLM) and to the history of black resistance in the city of Toronto," he told the audience. The film jumps forward 25 years with footage of contemporary protests in Ferguson and Toronto organized by BLM. There are also interviews with members of the Toronto chapter (BLMTO), illustrating the threads of continuity. "There was a point in the film where it showed what was won in the wake of the 1992 uprising and it looked pretty darn similar," Sandy Hudson, one of the co-founders of BLMTO observed on the panel. "It was almost formulaic. We're not under any illusions. Thankfully we learn from our OG's. It's very important to study your history so that you're not fooled." It Takes a Riot serves as a simultaneous affirmation of political activism and a rallying cry for its continuation. On the panel, Grandison talked about art's role keeping the movement alive. "As people are on the streets, you need people at the drawing table too. As people are banging down doors, I think you need people banging on the keyboards. Especially today where it's a visual society, a 140-character society — we need these really smart ways to penetrate the noise that's out there." The film will soon be available online through Ryerson's The Akua Benjamin Legacy Project where it will be accompanied with a study guide.